To all Margill Law Interest Calculator users, we have updated the 4.56.110(3)(b) interest rate table to correct the error discovered. In March 2017, while reporting the Historical Judgement Rates to the Office of the Code Reviser, they discovered an error in the rate from February 2016 through March 2017. If you want the latest version, please update your interest tables. 1. In terms of the accounting report and accounting identifiers, are these captured at the borrower level, or the record level? How is this selection made and where is it used/displayed on the accounting report? 2. In our accounts we split interest accrued and other fees by product type, i.e. a separate GL account by product, is it possible to do this in the accounting report or would we need select and run it for each product type? 1. You can have as many General Ledger (GL) accounts as you want in Margill and report for each. These can be assigned to the Loan (Record), the Borrower and/or the Creditor. 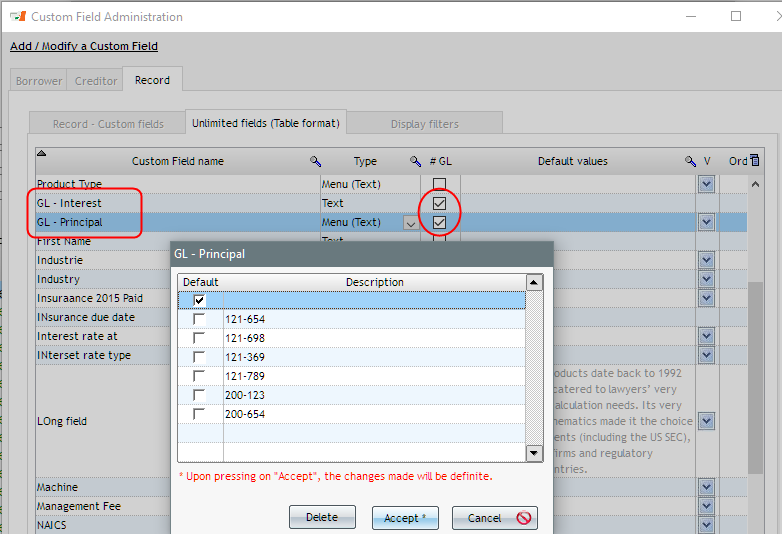 These can be included as Custom fields by checking the “#GL” column. You can even create a scroll menu if there aren’t hundreds of these. You can populate these very quickly with the Global changes (select Records in the Main window, right click with the mouse). The GL accounts created are then used in the Accounting Entries report (only one Record has an account below…). This detail can then be exported to Sage, QuickBooks, Excel, CSV, TXT. Or you can get a summary – “By Account” tab. 2. Yes you can have a GL account by product type. 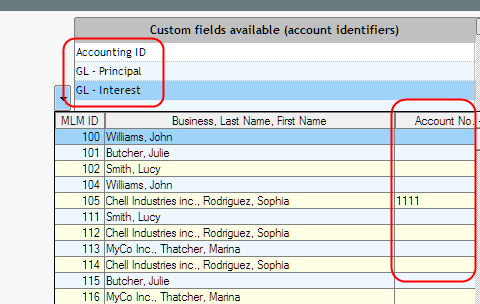 If each Record (or loan) is for one product type, then you would create a scroll menu for the GL by product type and assign to each Record individually. You can then run one report with all your records and the proper GL number will be assigned for each debit and credit.